Don't just wash your hair - fuel it. 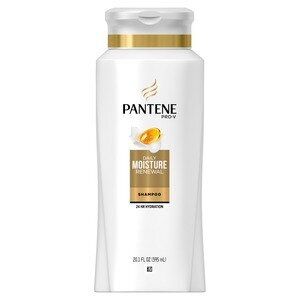 Pantene Pro-V Daily Moisture Renewal Shampoo puts in more than it takes out with every wash. With a potent blend of Pro-V nutrients, it gently cleanses your hair as it fuels every strand with strength. The formula helps lock in moisture, so you're left with intensely hydrated, strong and beautiful hair. Pair with Daily Moisture Renewal Conditioner for healthier hair with 2X the moisture. *, *When used as a system with Daily Moisture Renewal Conditioner based on moisturized feel vs. non-conditioning shampoo. Water, Sodium Laureth Sulfate, Sodium Citrate, Cocamidopropyl Betaine, Sodium Xylenesulfonate, Stearyl Alcohol, Sodium Lauryl Sulfate, Sodium Chloride, Cetyl Alcohol, Fragrance, Citric Acid, Sodium Benzoate, Polyquaternium-6, Guar Hydroxypropyltrimonium Chloride, Tetrasodium EDTA, Trisodium Ethylenediamine Disuccinate, Trihydroxystearin, Mica, Titanium Dioxide, Panthenol, Panthenyl Ethyl Ether, Silica, Iron Oxides, Methylchloroisothiazolinone, Methylisothiazolinone.